These are practical and cute – the heels are high enough to make your legs look good, yet the front strap makes them comfortable and easy to wear. 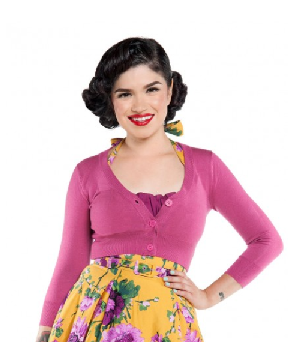 These skirts are an excellent basic for any pinup wardrobe. You can team them with little fitted tops like they have above, or a peasant top – anything really. And they look great with a boofy petticoat underneath too! I love these prints … they’re such fun, and a dress is always easy to wear and looks so well “put together.” If it was a bit on the cold side, I’d wear it with this lemon cropped cardigan (same as the one in pick number seven), which I already have so I don’t have to include it in my $800! These are just too cute … probably not entirely practical, but who cares – they’re pretty! As I said, I already have this cardy – in fact I have it in black, red, mint and lemon. They’re the perfect length for a shorty like me and look great with PUG dresses. This is gorgeous … I might even wear it with my “pick number one” – the yellow Molly dress. I love polka dots, so this was always gonna work for me! This is beautiful – I’d wear it with some black capris or a pencil skirt and some black patent heels. I love this dress … the little sleeve is really flattering and having a sleeve means you can wear it to work without a cardy. Perfect! And that leaves just $6.40!!! What would you purchase at PUG if you had $800? All images are taken from the Pinup Girl Clothing website, and I’ve just used the $US figure rather than converting it to $NZ because it’s easier! You actually got alot for your $$, great shopping with you!